VEMT – The Customer Experience & Loyalty Marketing Cloud. Persuasion Marketing and Marketing Technology. – Customer Experience Management Platform: We deliver the building blocks to create autonomous scalable Customer Experience programs and increase customer loyalty. Persuade your customers to spend more, and more often. Provide compelling Customer Experiences that increase conversion and engagement. Get the right offer to the right customer. Automated. …and 600 more strategies. Implemented. Why choose VEMT as your CXM? How to try? How to buy? Based on your customer journey(s), we can demonstrate how you could implement strategies fast and effective. Just connect with us for a demo. Let us help you make a few decisions: on channels, integrations and ambitions. We’ll create a flexible proposal based on those decisions, craft it according to your feedback, so the only action left is to say ‘Yes’ to the proposal and let us do the work. Your program will deliver value in many ways: increase spend per visit, increase visitor frequency, lengthen the customer relationship, increase advocacy and engagement. You choose, you create, you harvest. We’ll get your staff started with a quick and smooth on-boarding. If you want to, we’ll get your customers on-board too. Simplicity. Our intuitive platform with its Persuasion Planner allows you to create marketing programs designed around rewards, influencing customer behavior. It’s easy to get started. You’ll see results immediately. Loyal customers buy more. And they cost less. Their endorsements refer others to your company, impacting your business by boosting profits. Our platform turns your Marketing Department into a measurable profit center. Automate personalised, predictive decisions driven by real-time insights gained by the data in the VX42™ platform tracking customer behavior. Automatically respond through Persuaders™ and optimise value continuously. From launch, your program produces measurable results. Find out what influences or motivates your customers in minutes. Watch loyal customers come back more frequently and spend m,ore per visit. See how their endorsements refer others to your company, boosting profits. Our platform and its Persuasion Planner have been built for ease of use, while at the same time be extremely powerful. 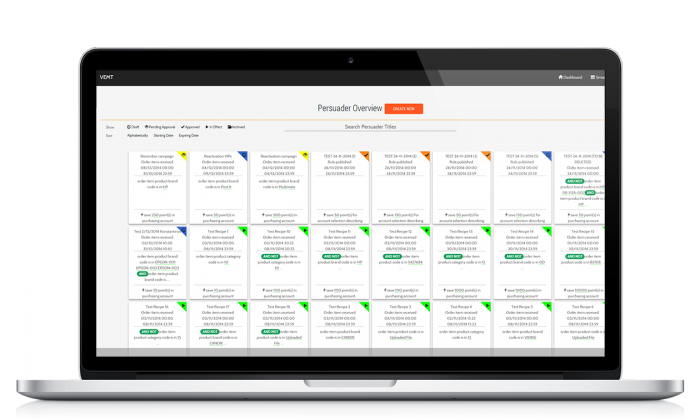 You’ll be able to set-up automated routines with Persuaders™ in minutes and scale up and down. Simply pick and choose the functionality you need from our intuitive interface. Not all Customer Experience Management Platforms are created equal. VEMT’s platform is powered by technology and driven by psychology, in the form of Persuaders™: rules that automatically trigger rewards, benefits and privileges when activated by events, including purchases, referrals and social media participation. Find out why we are trusted by companies worldwide to deliver marketing power to over 16 million consumers. Your growth path is worth a call.